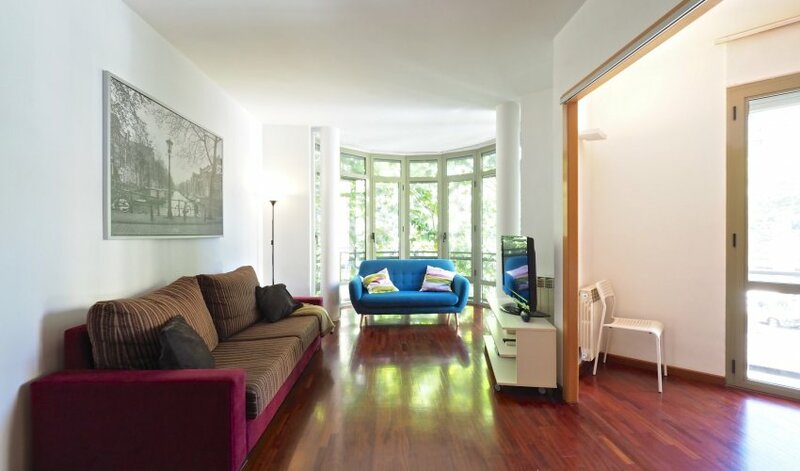 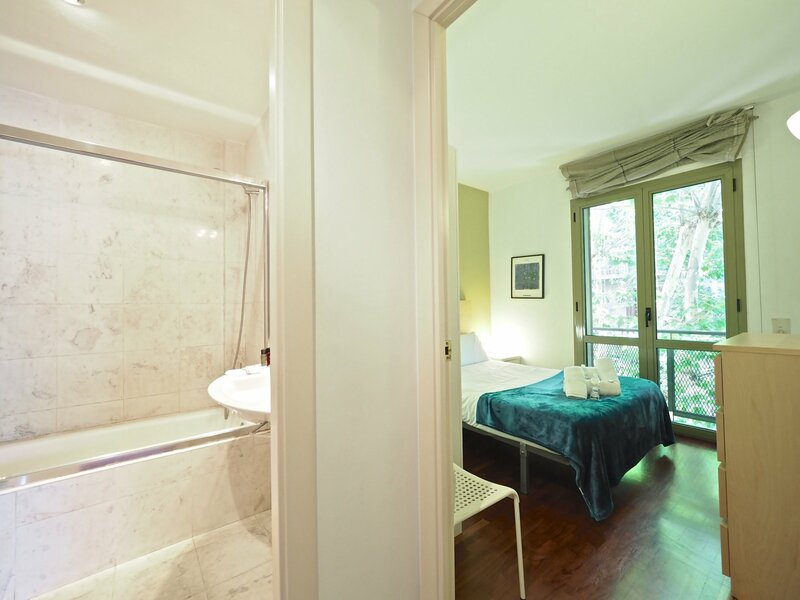 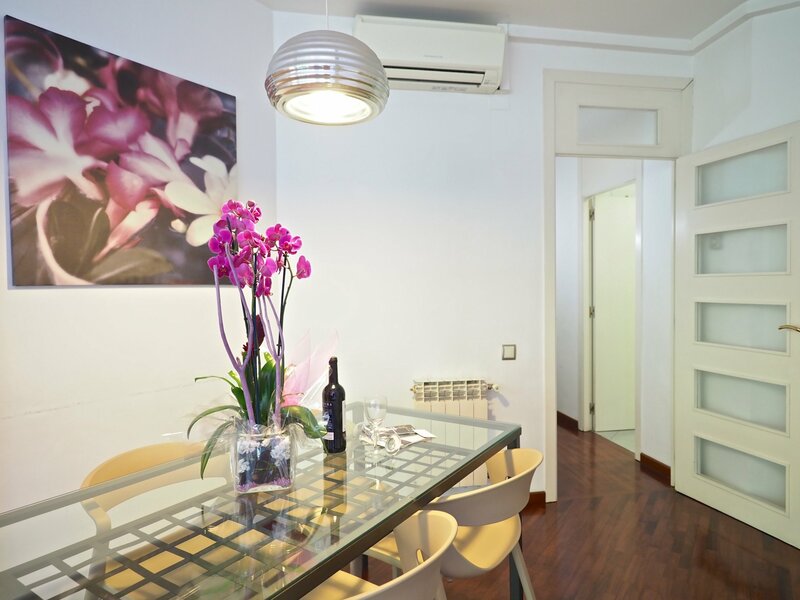 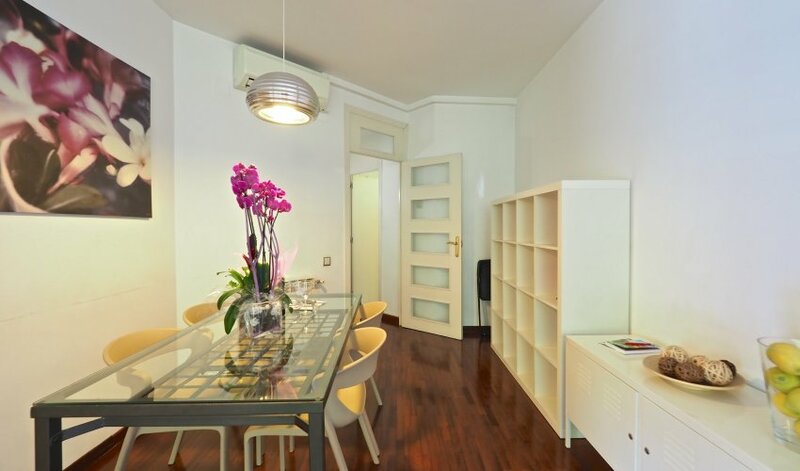 The Gaudi Suites I apartment is a beautiful apartment for rent in Barcelona with air conditioning and Internet. 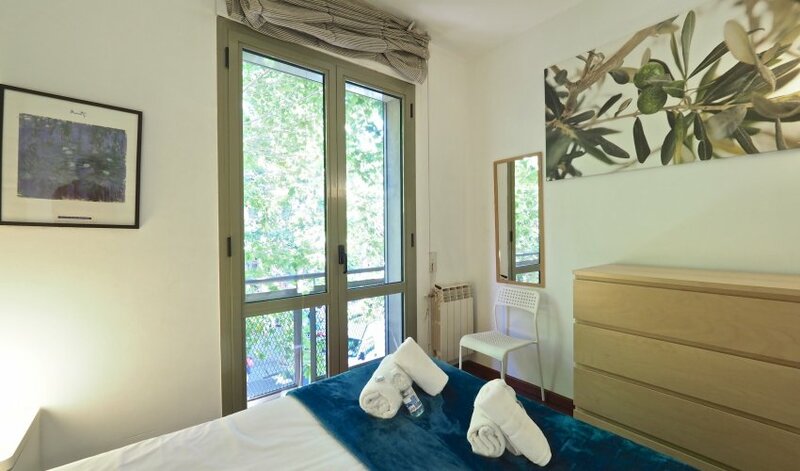 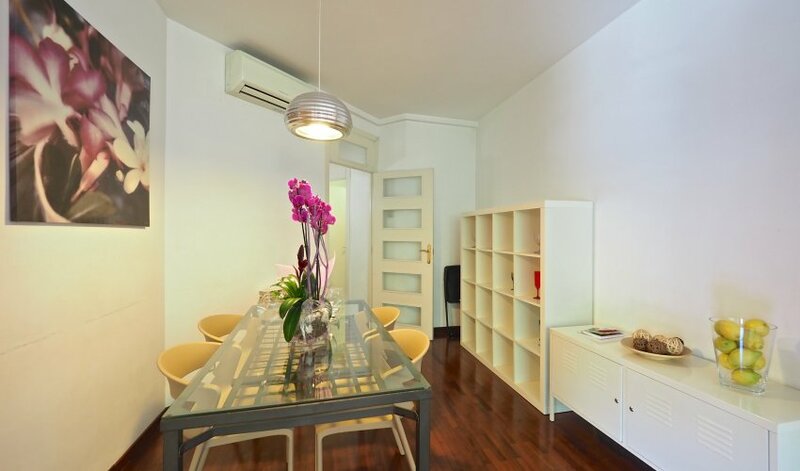 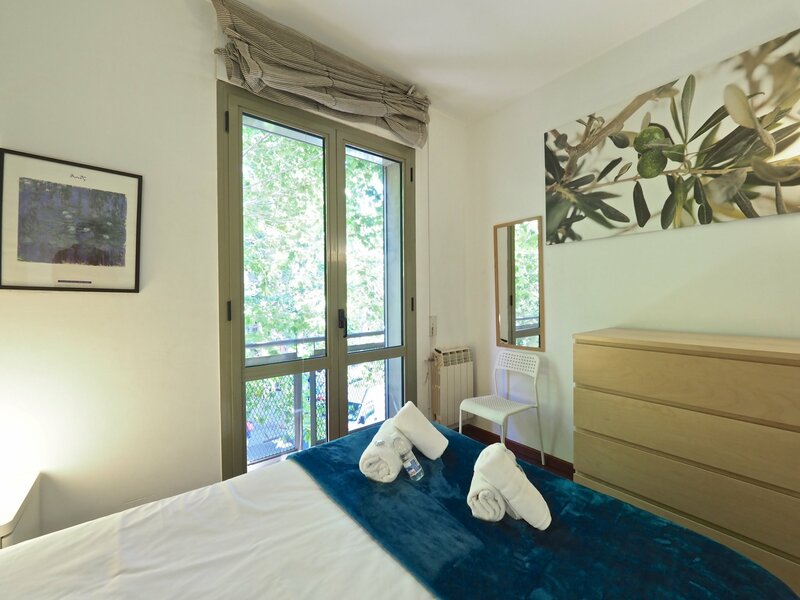 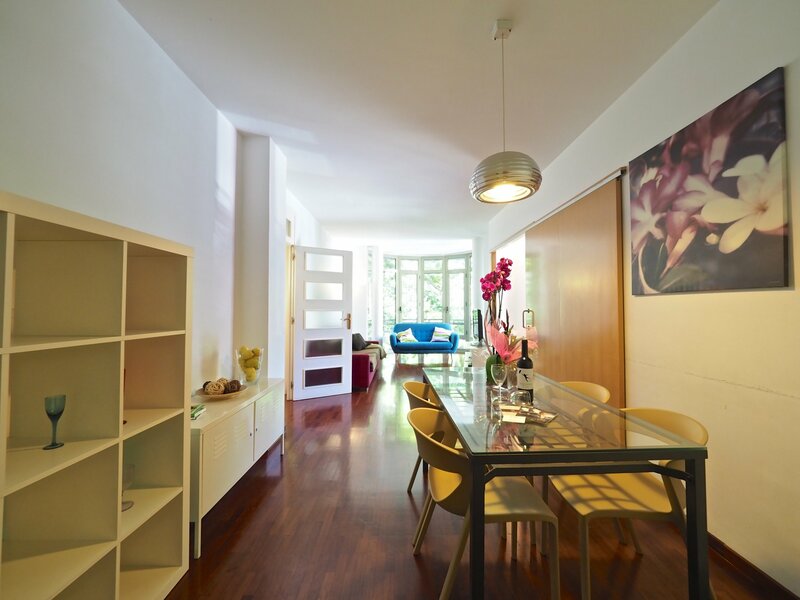 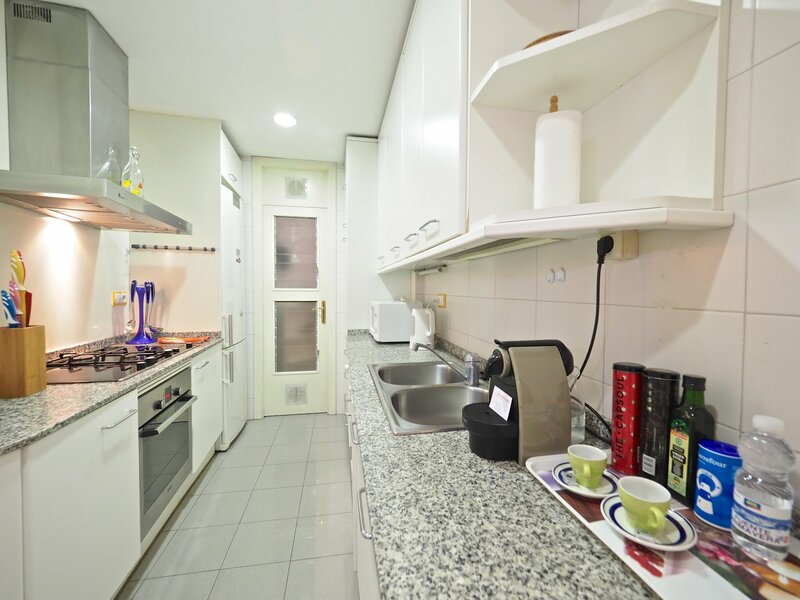 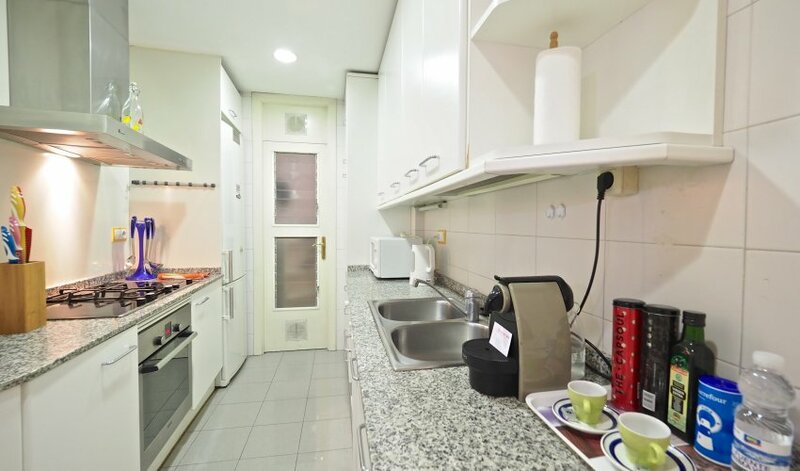 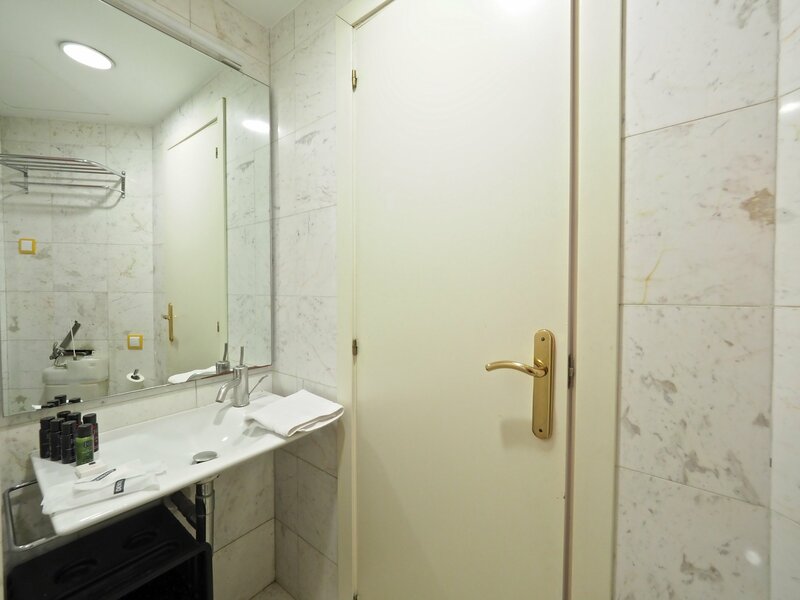 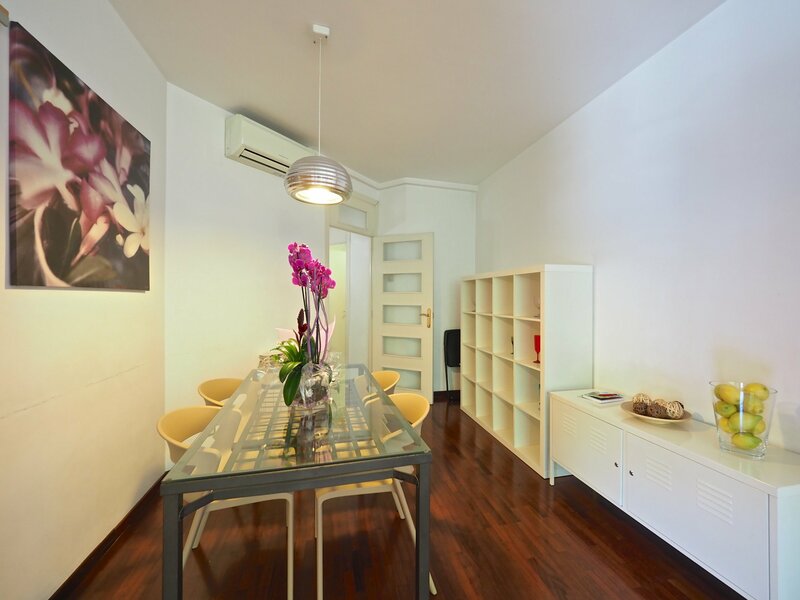 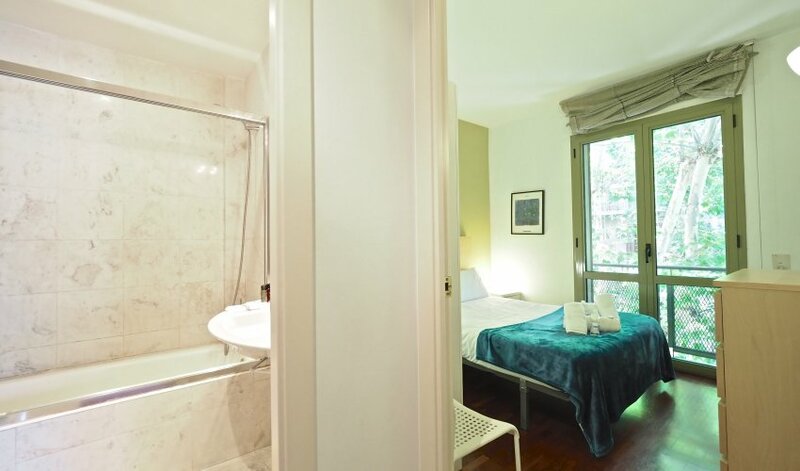 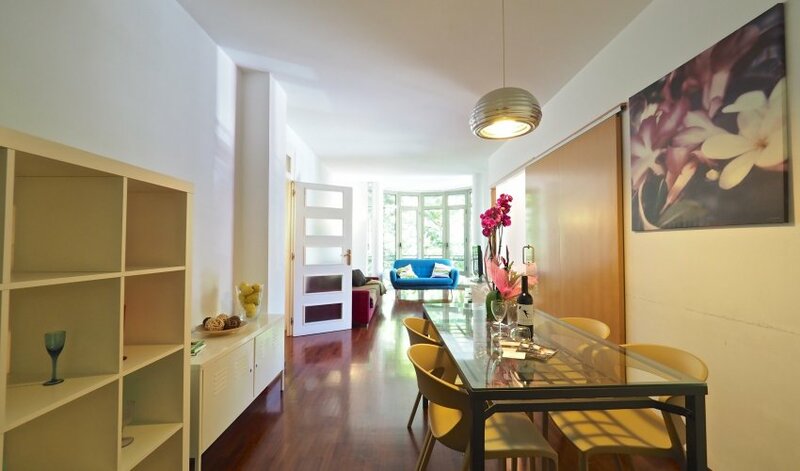 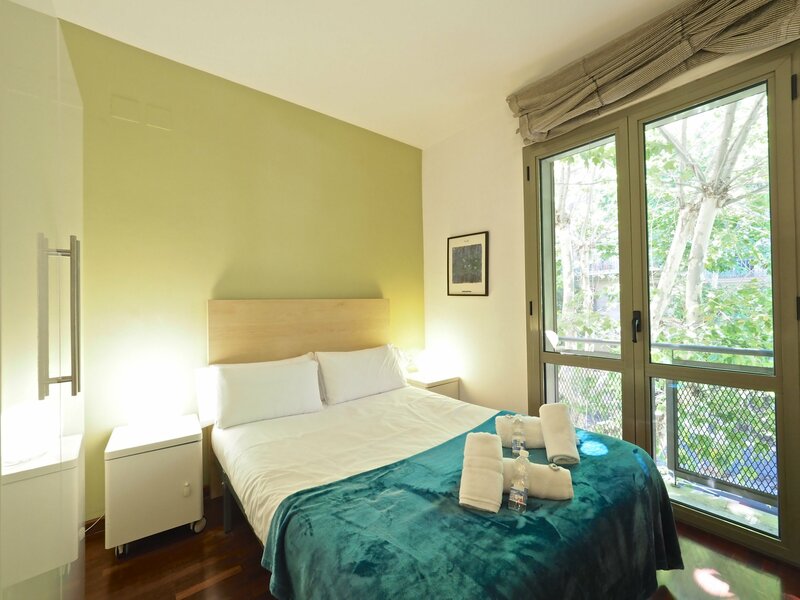 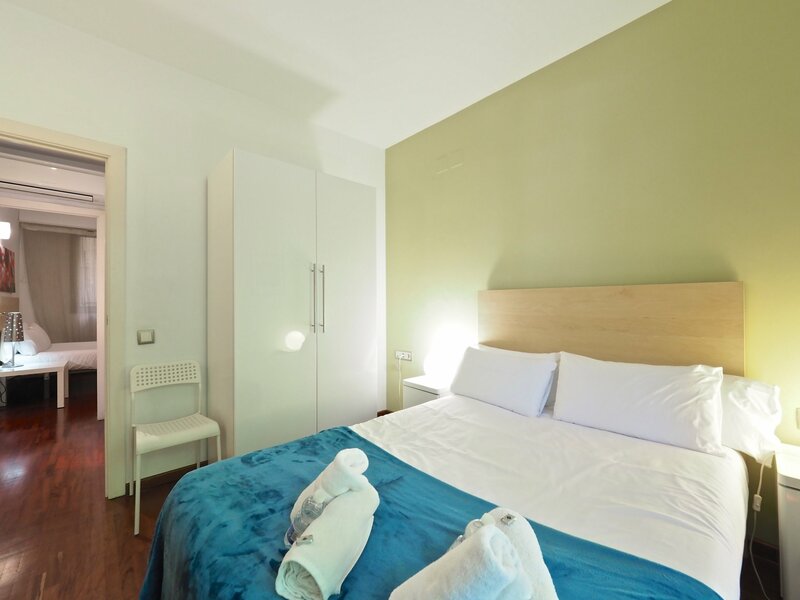 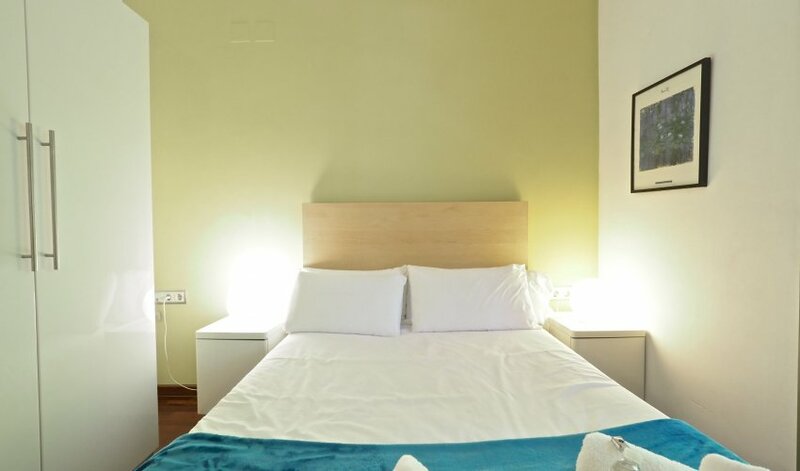 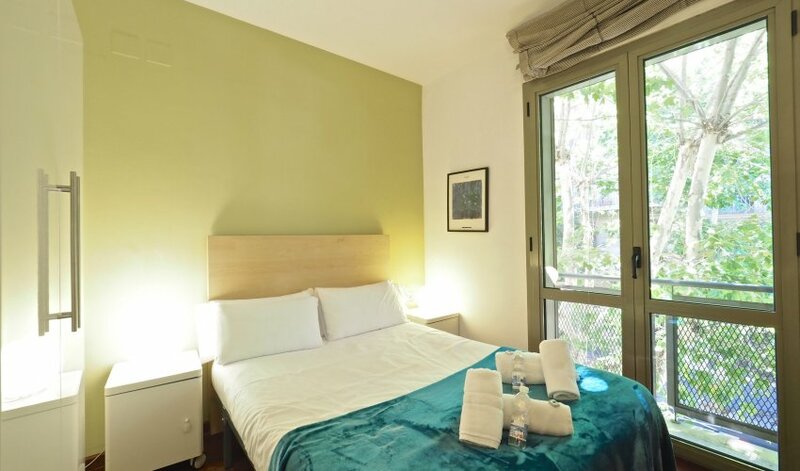 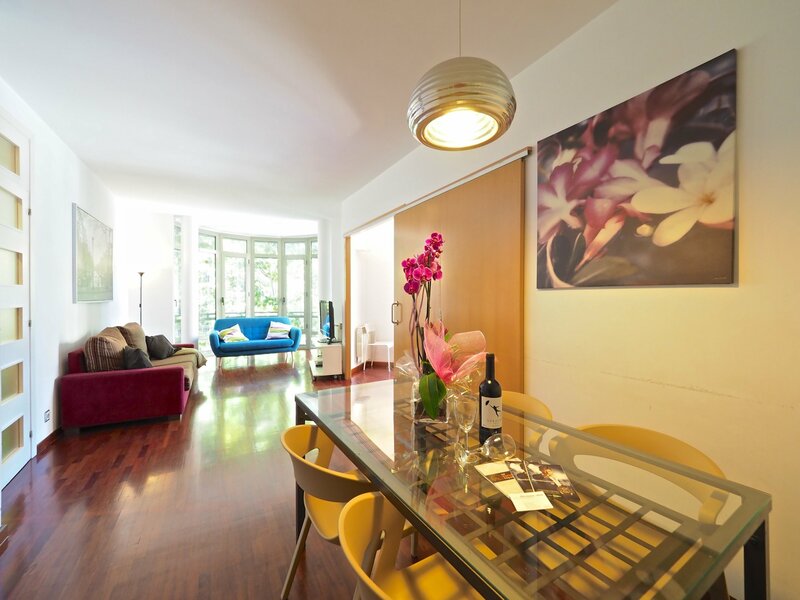 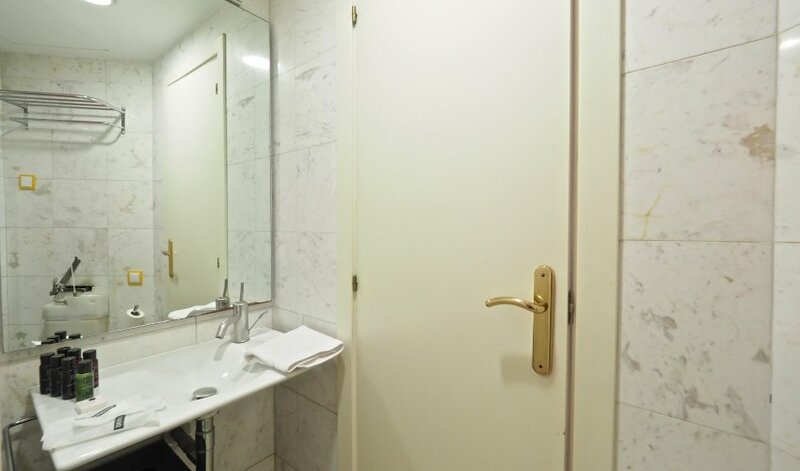 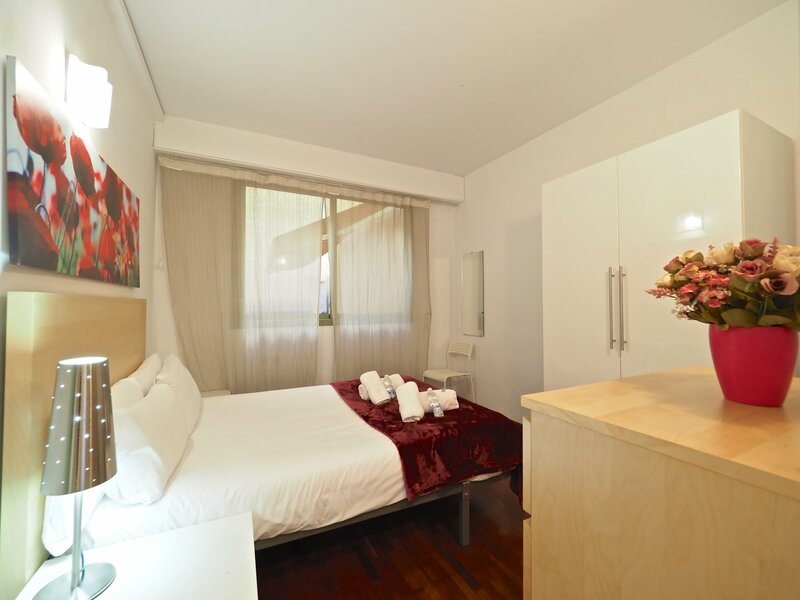 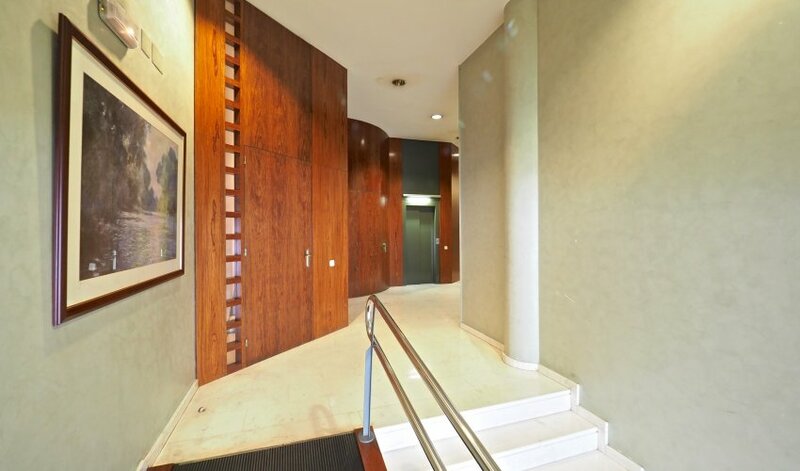 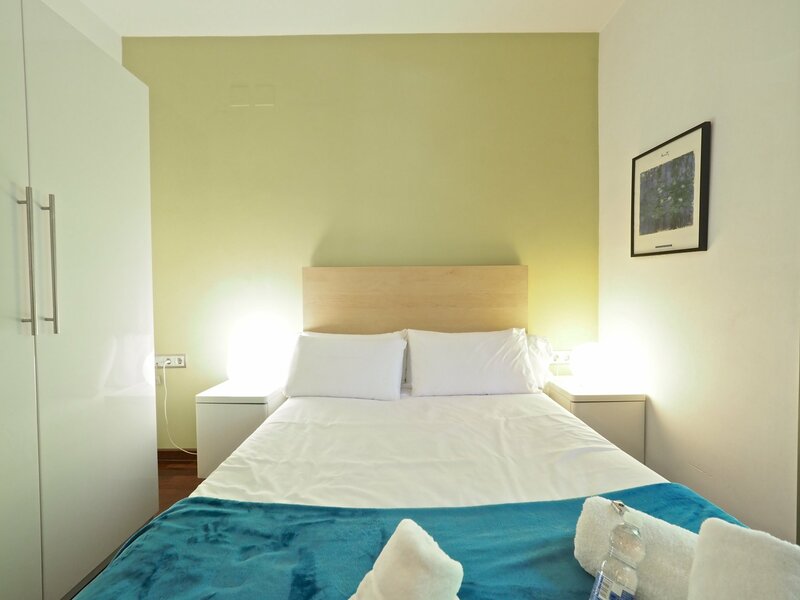 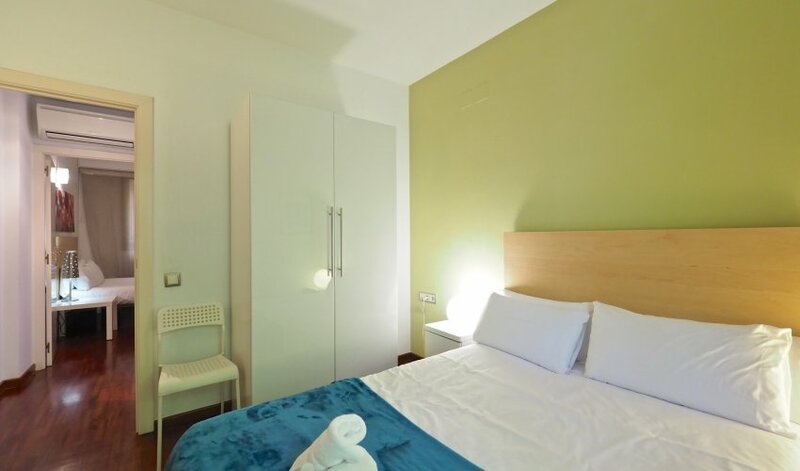 Its location, very close to Paseo de Gracia and Diagonal, makes it ideal for business or tourism. 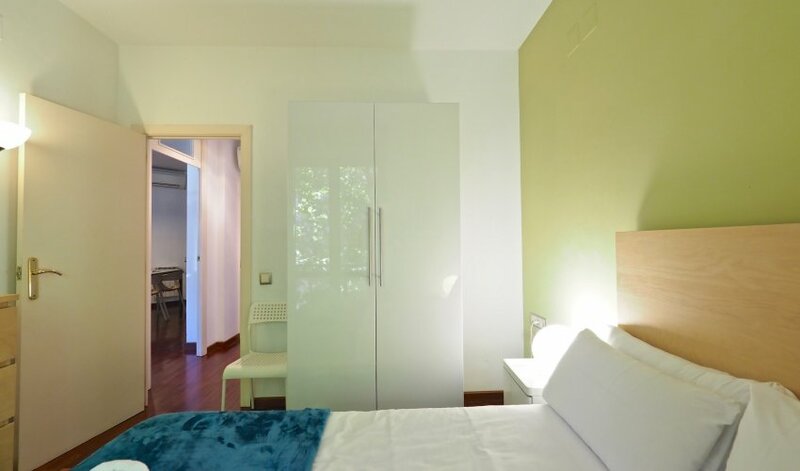 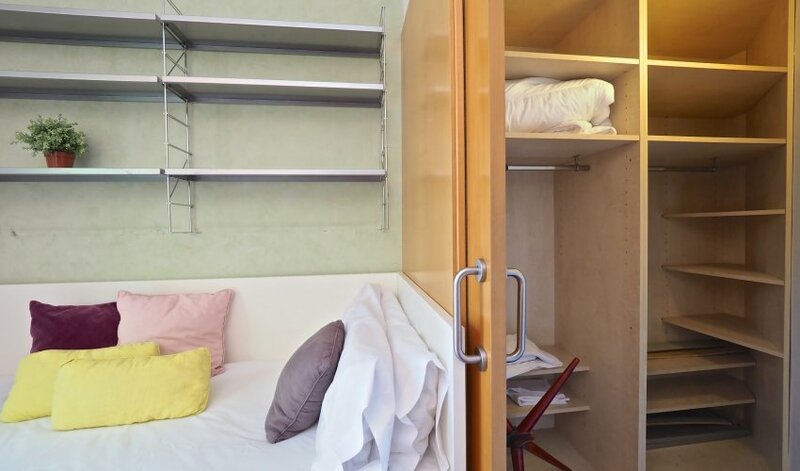 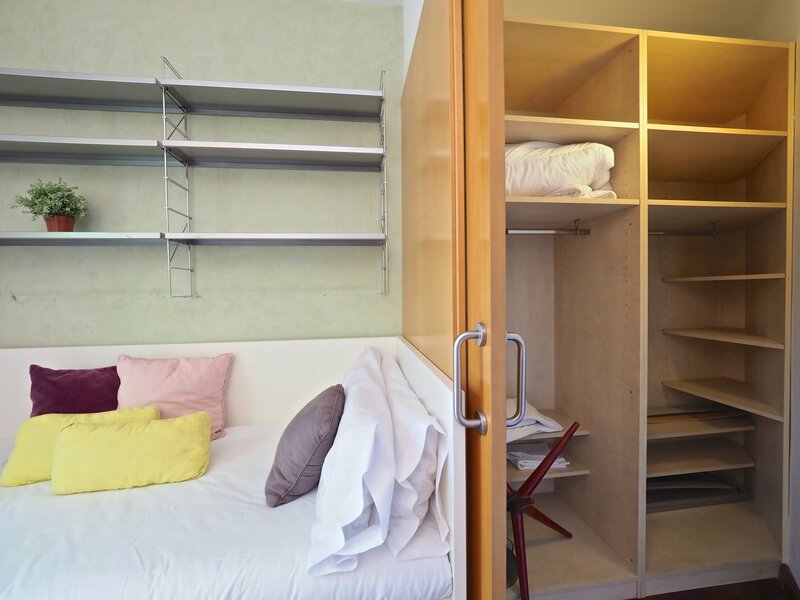 This apartment rental is composed of three double rooms: two rooms with double bed, wardrobe and a third room with a sofa bed and dresser. 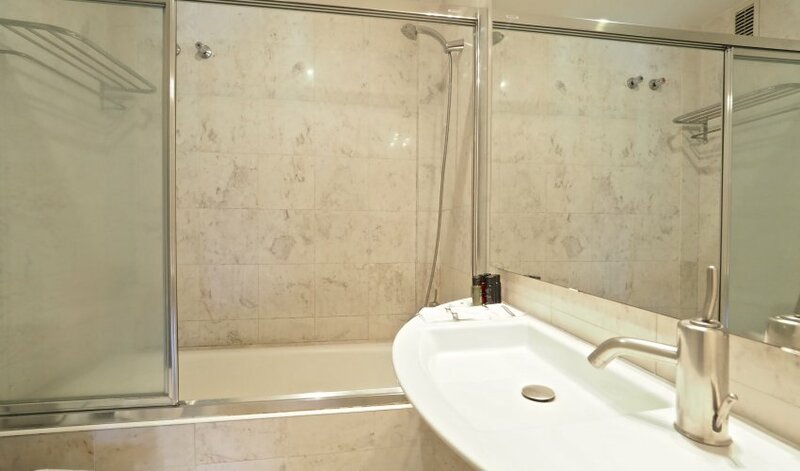 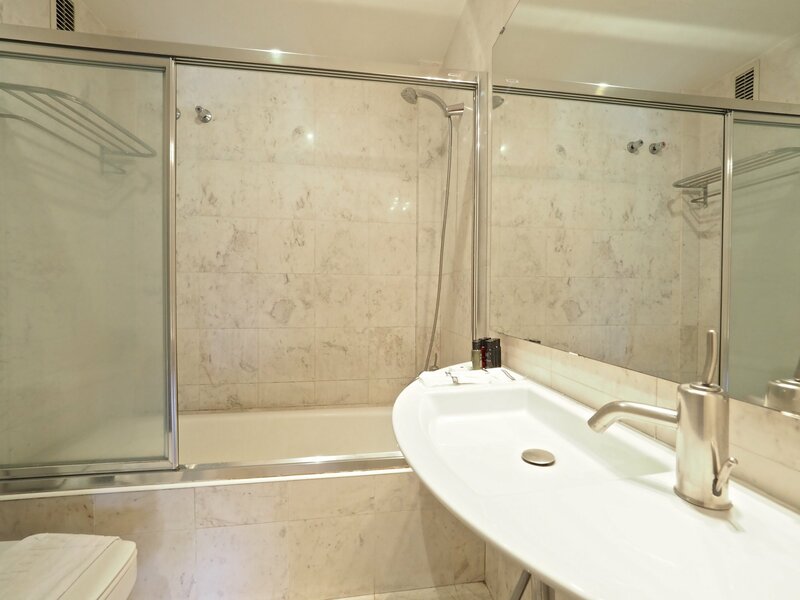 It has two bathrooms, one with bathtub and second with shower. 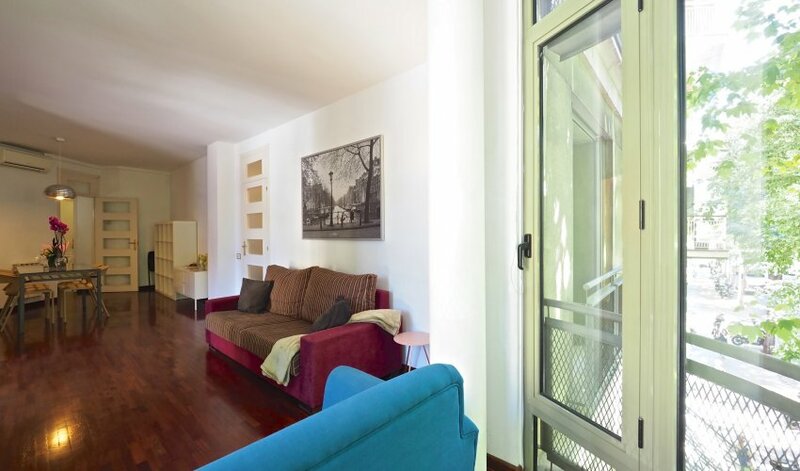 It has a spacious indoor lounge, which is very sunny thanks to its two balconies with view on the internal courtyard, and it is equipped with two chairs and a table with six chairs. 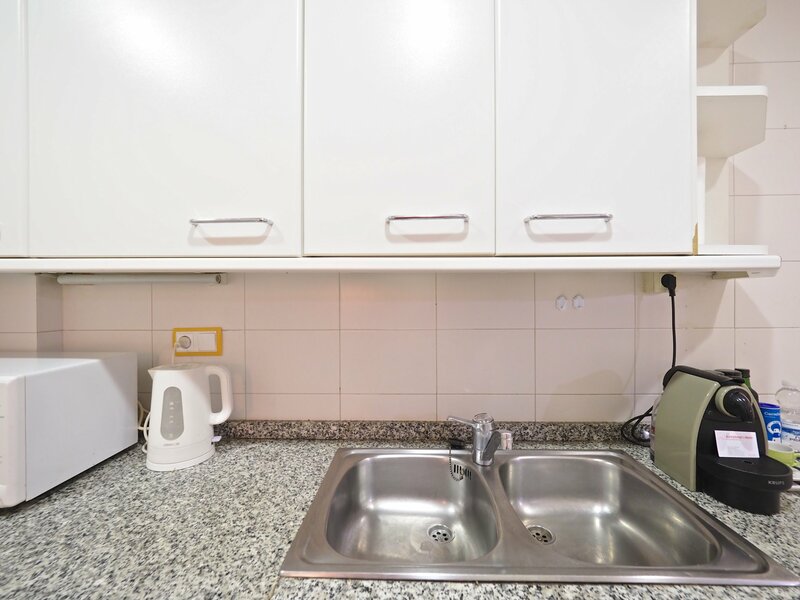 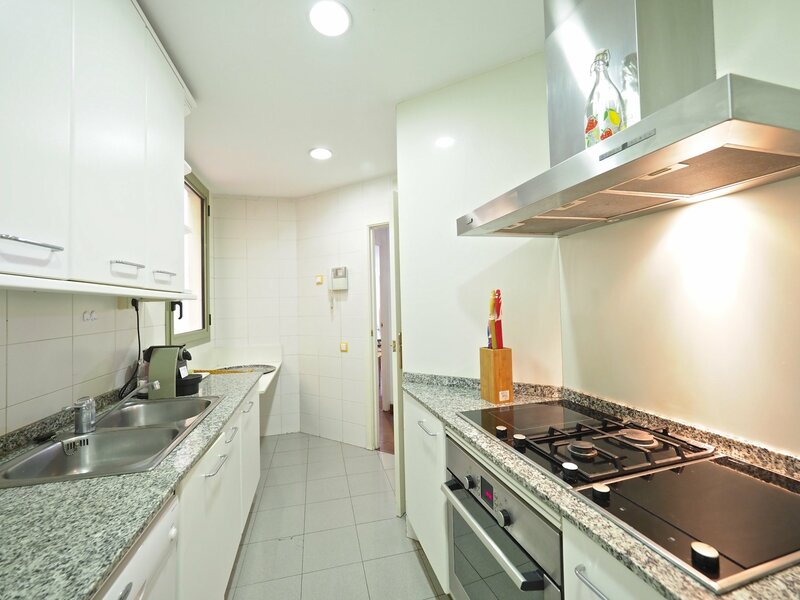 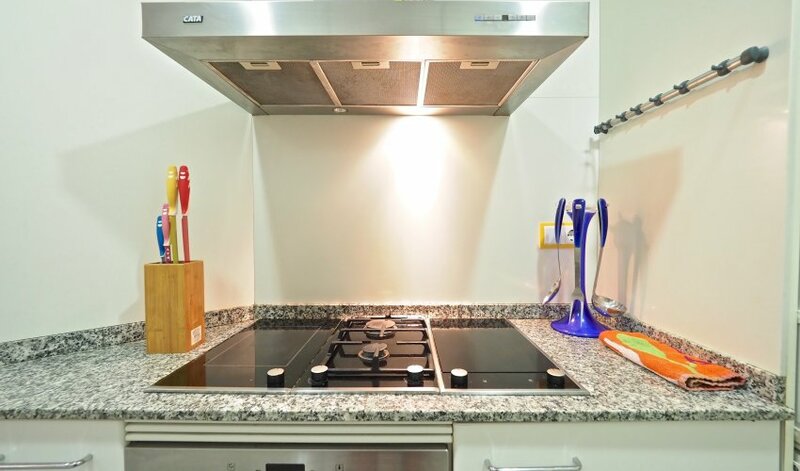 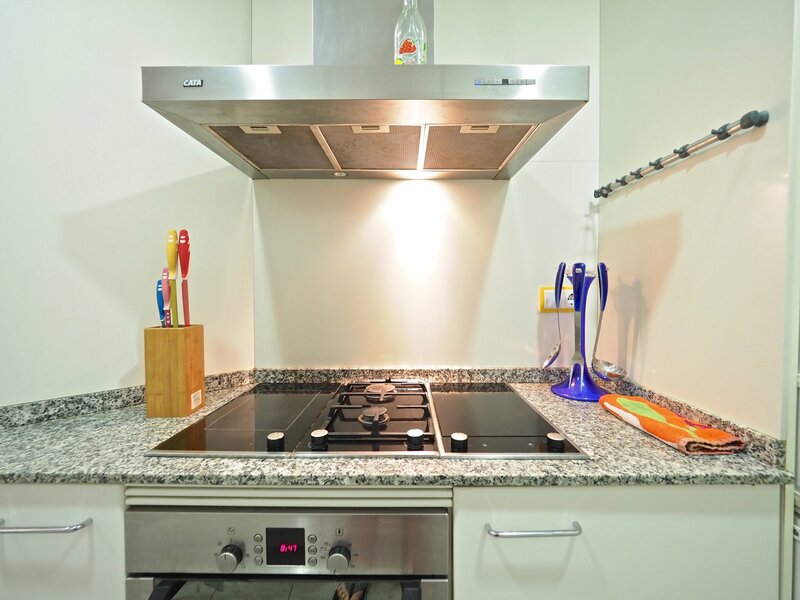 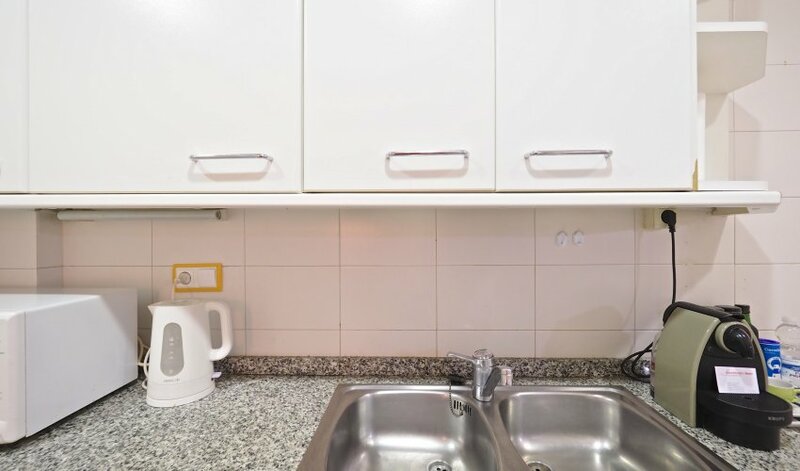 The kitchen, independent, is fully equipped with the following appliances: fridge / freezer, oven, microwave, dishwasher, toaster, coffee maker and washer / dryer. 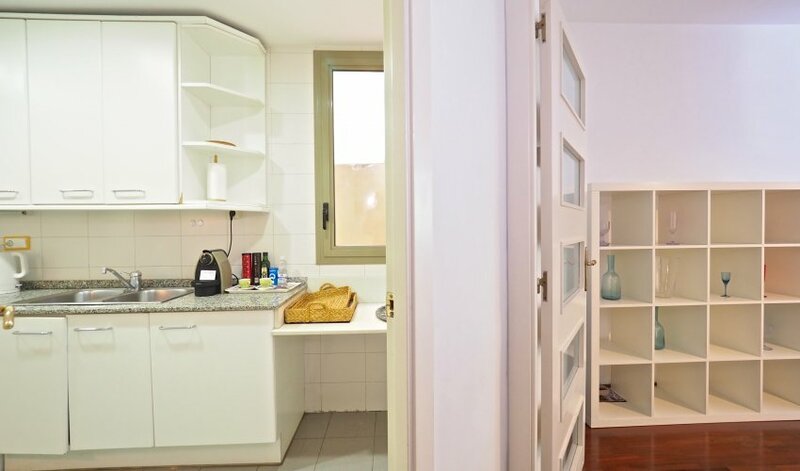 There is an access from the kitchen to the courtyard. 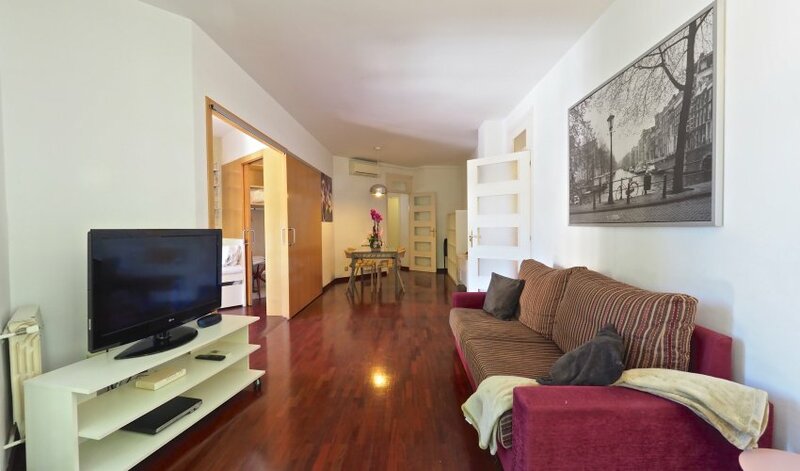 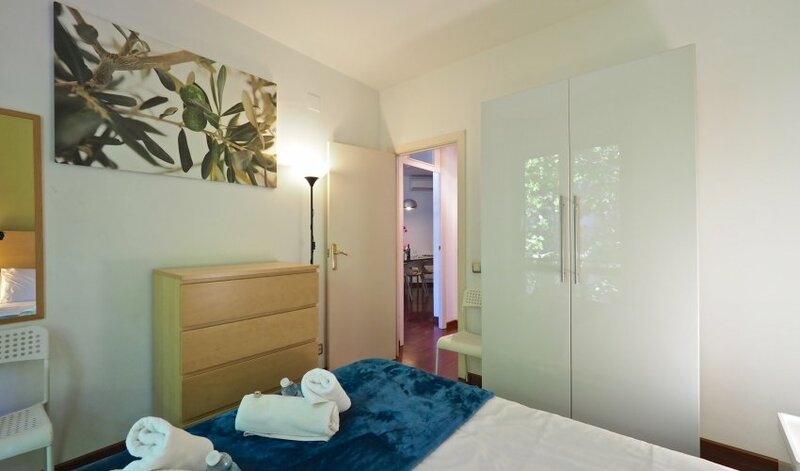 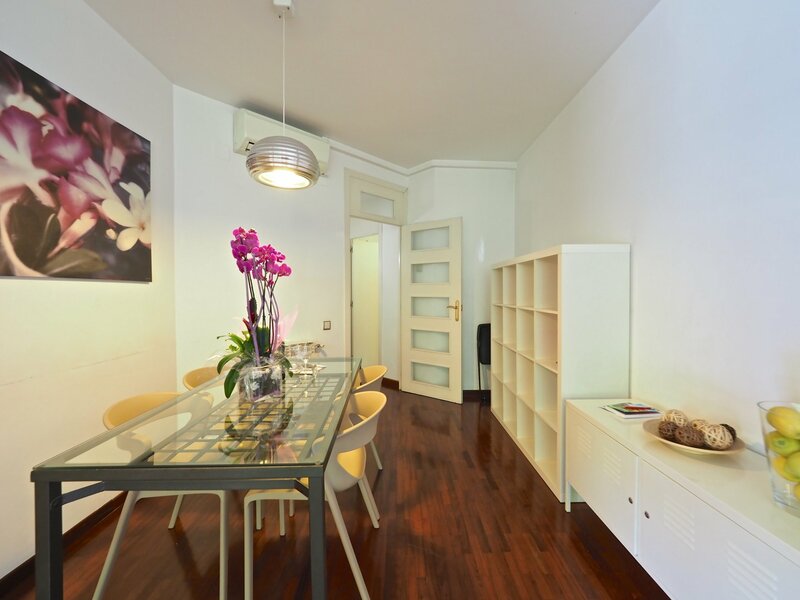 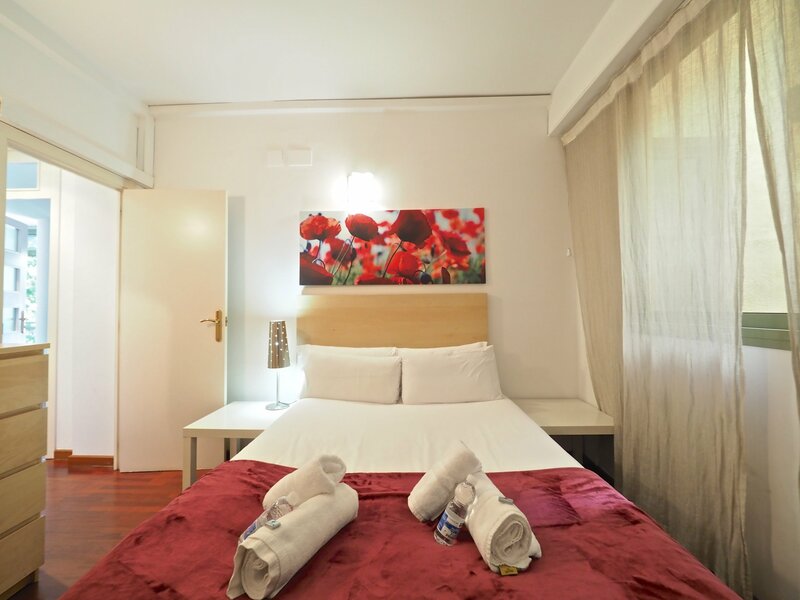 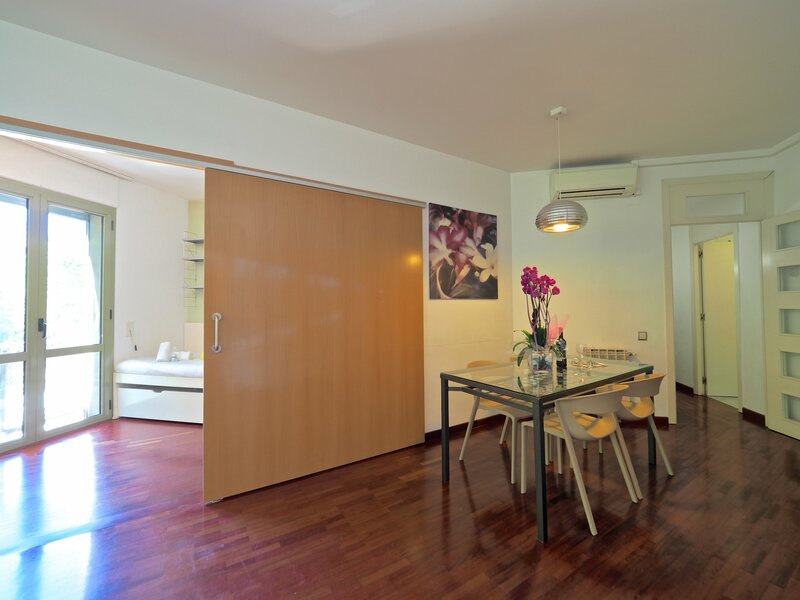 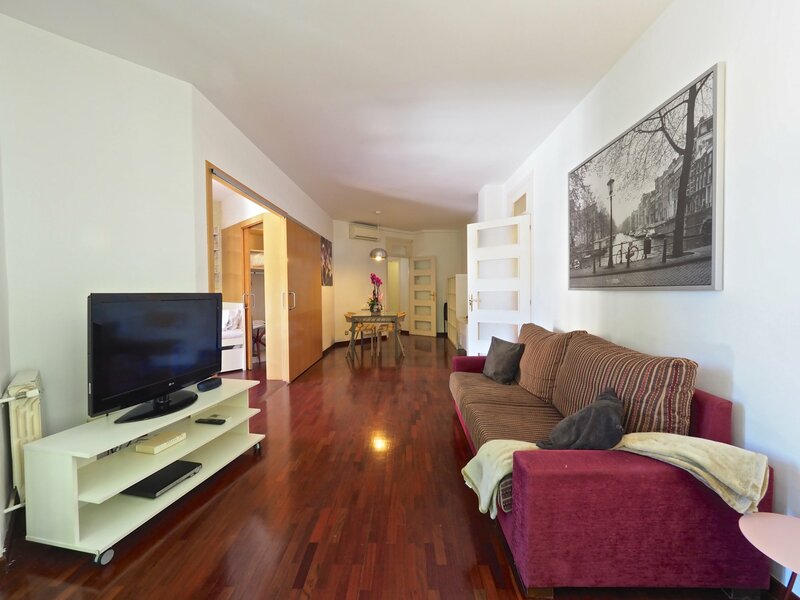 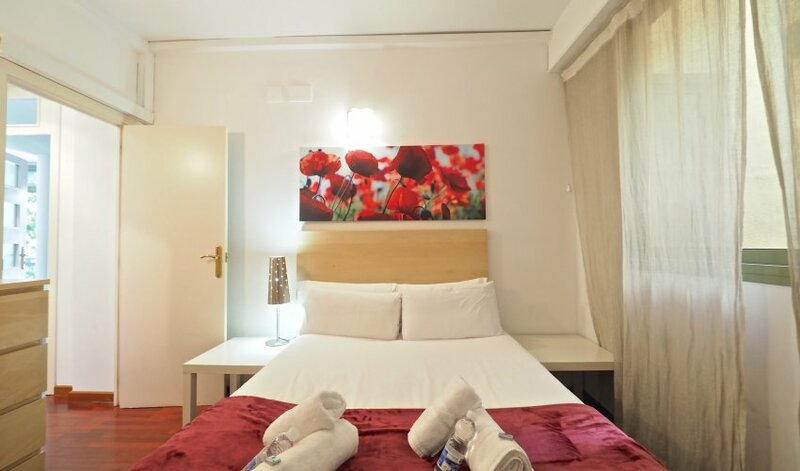 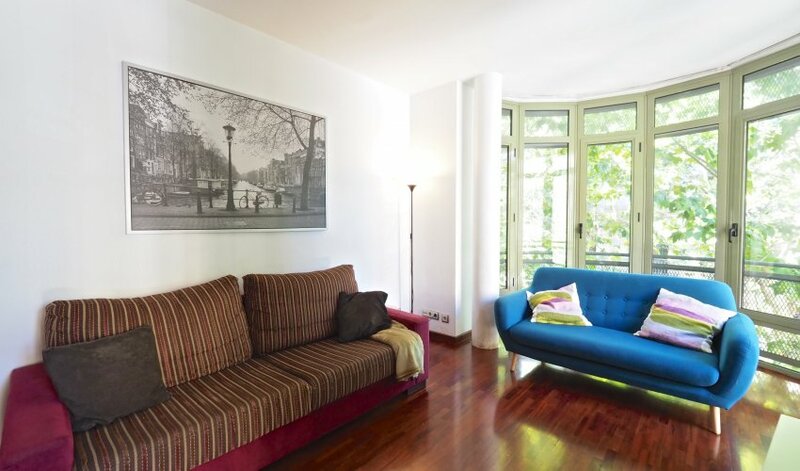 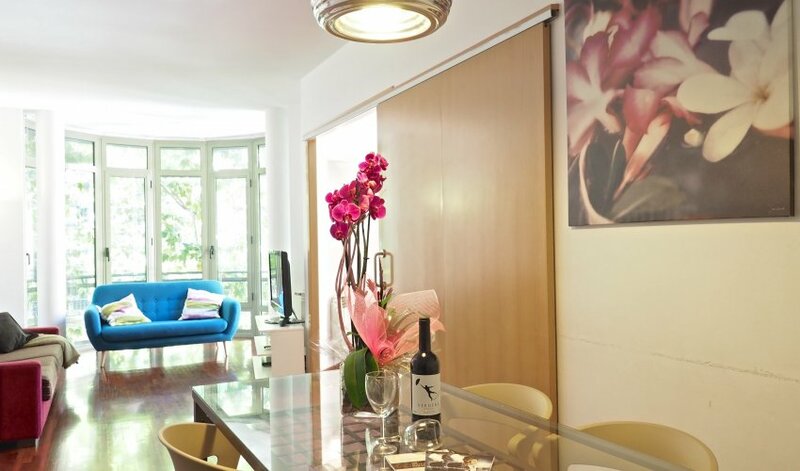 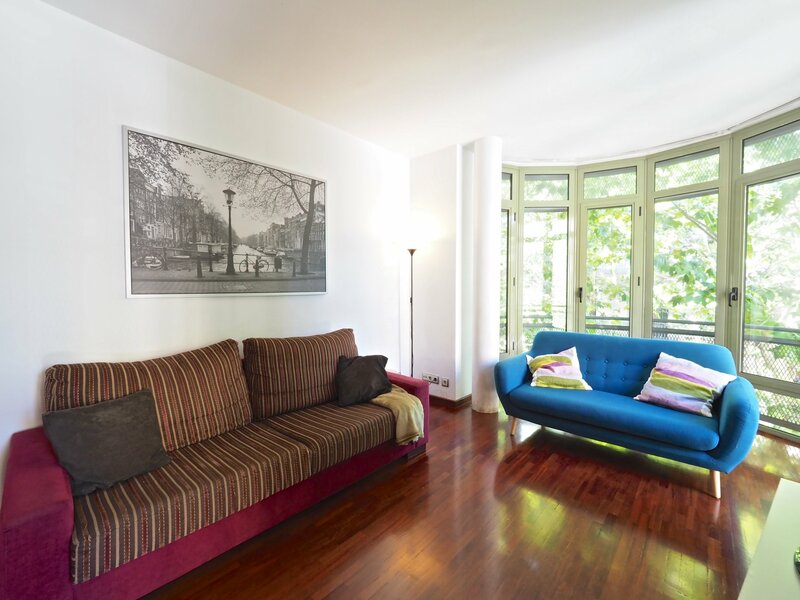 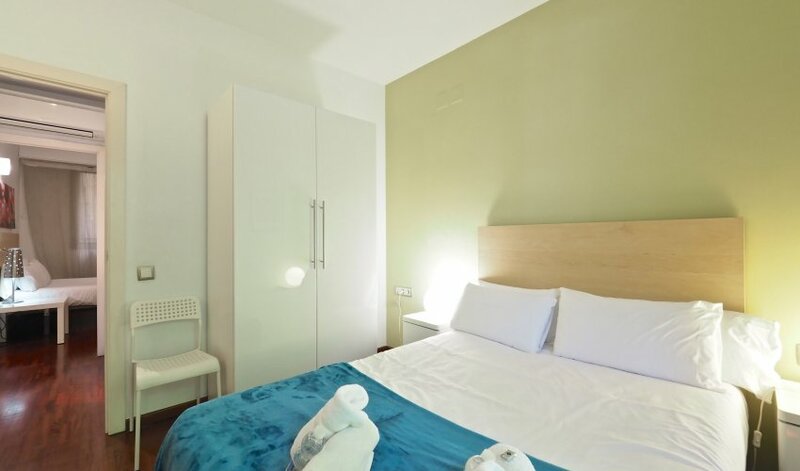 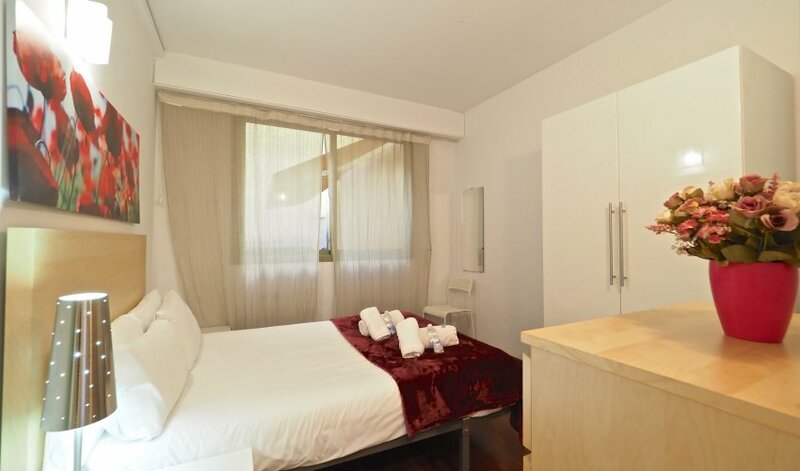 This modern holiday apartment has parquet flooring, heating, air conditioning (in the dining room and between two double rooms), TV with Apple TV and Netflix available, DVD player, CD player and wireless ADSL internet connection. 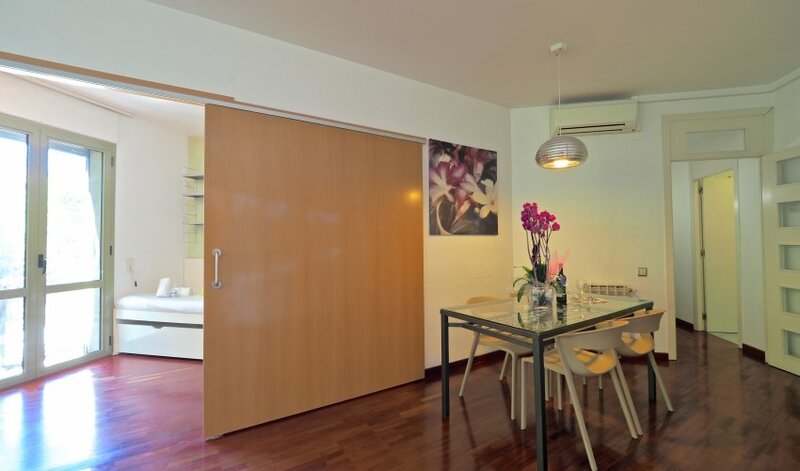 Its 90 square meters can host up to six people. 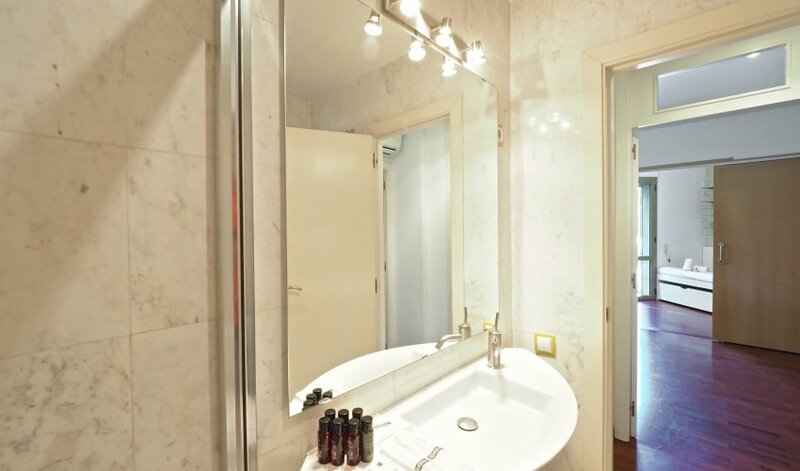 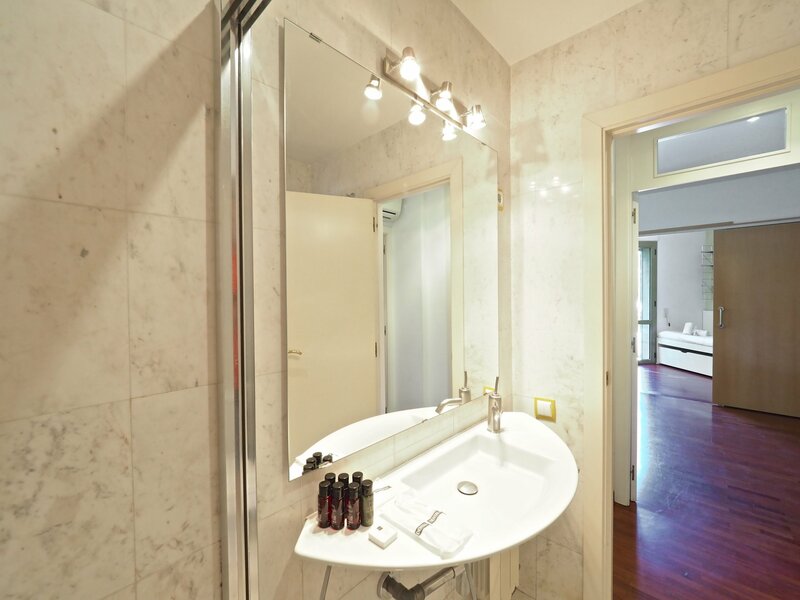 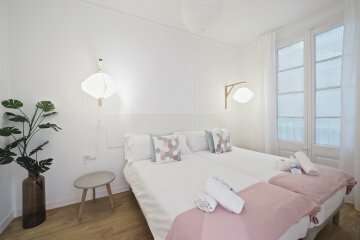 The Gaudi Suites I apartment has been totally renovated in 2010 and is located on the first floor of a splendid building. 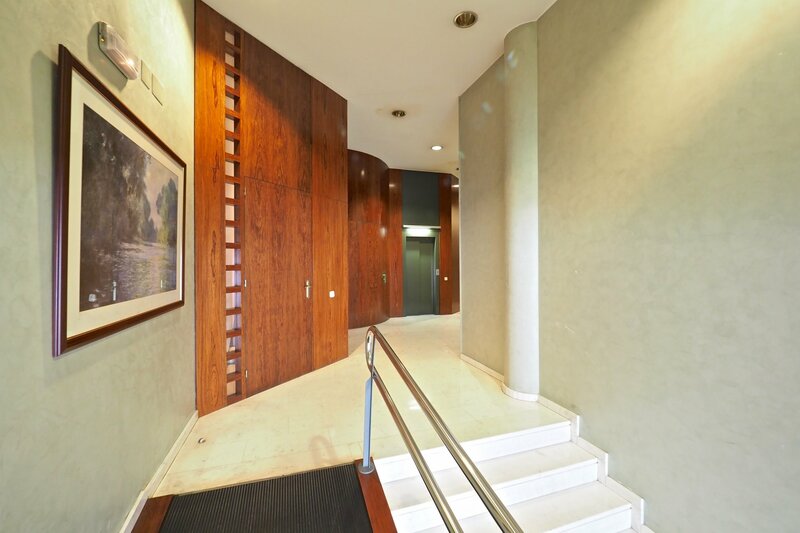 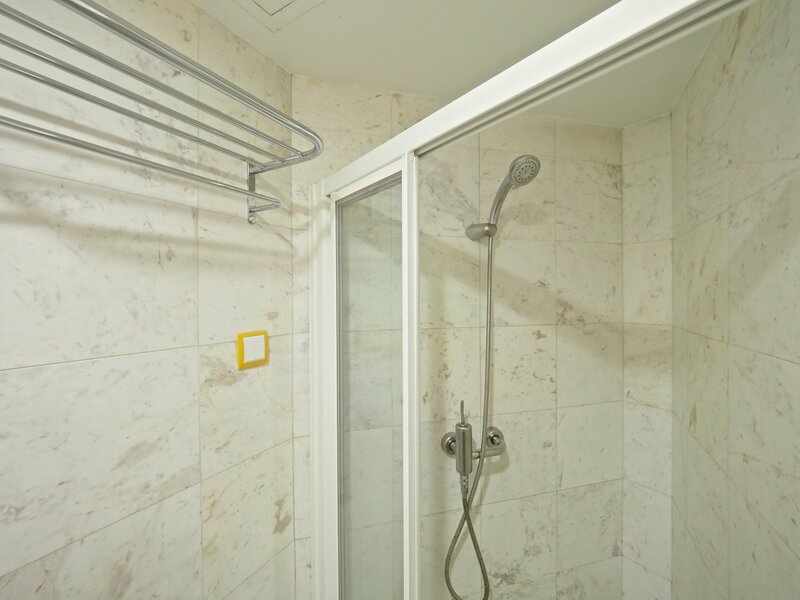 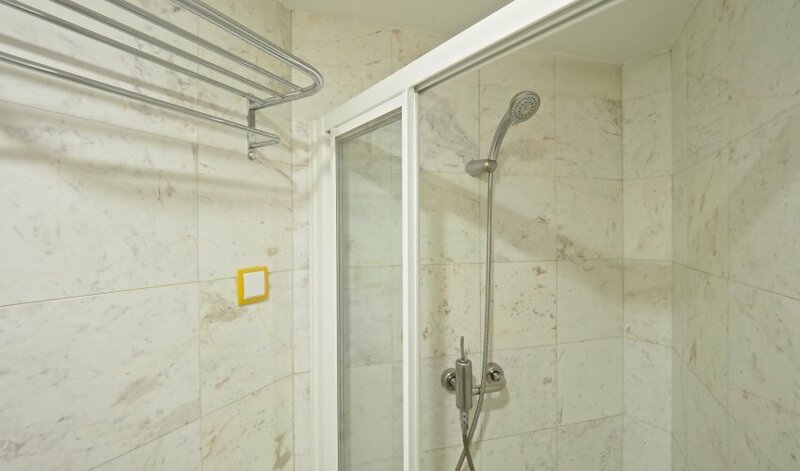 It is accessible for wheelchairs and has an elevator and a video intercom. 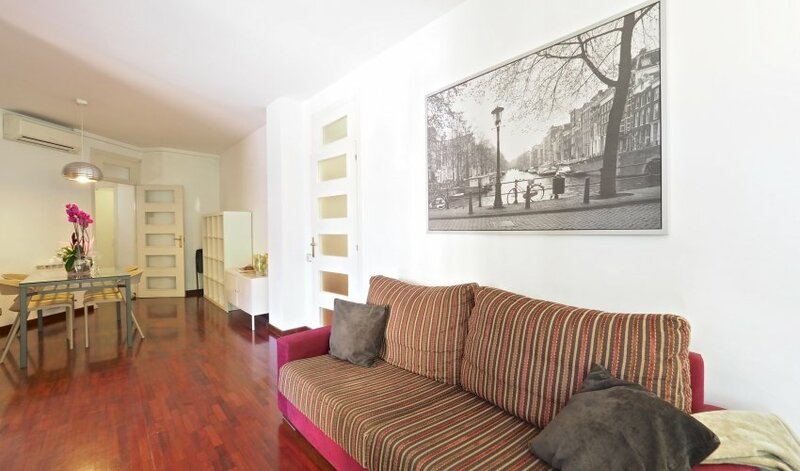 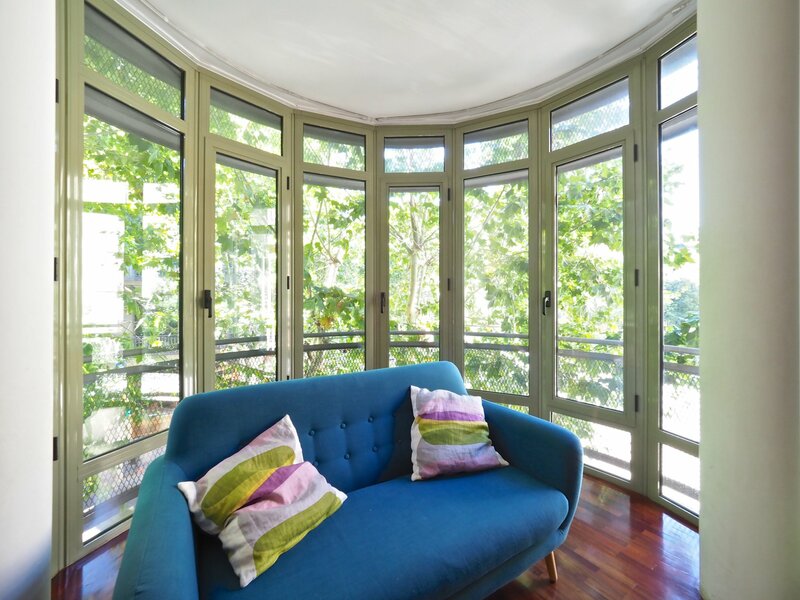 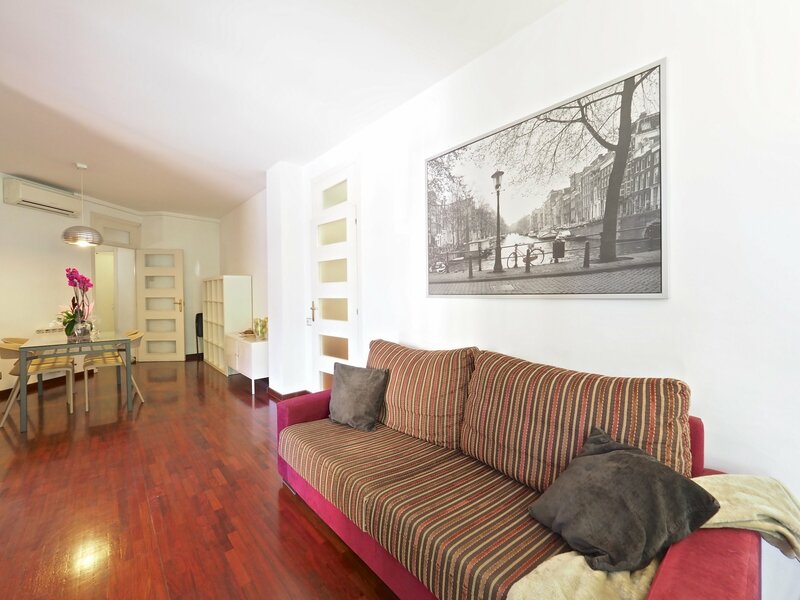 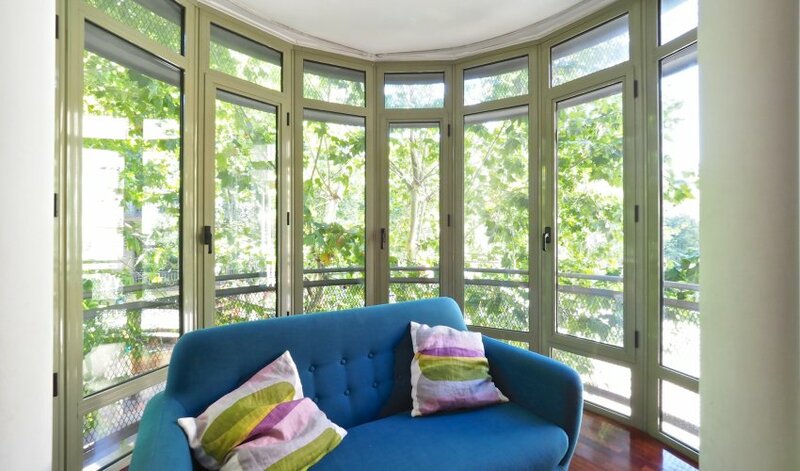 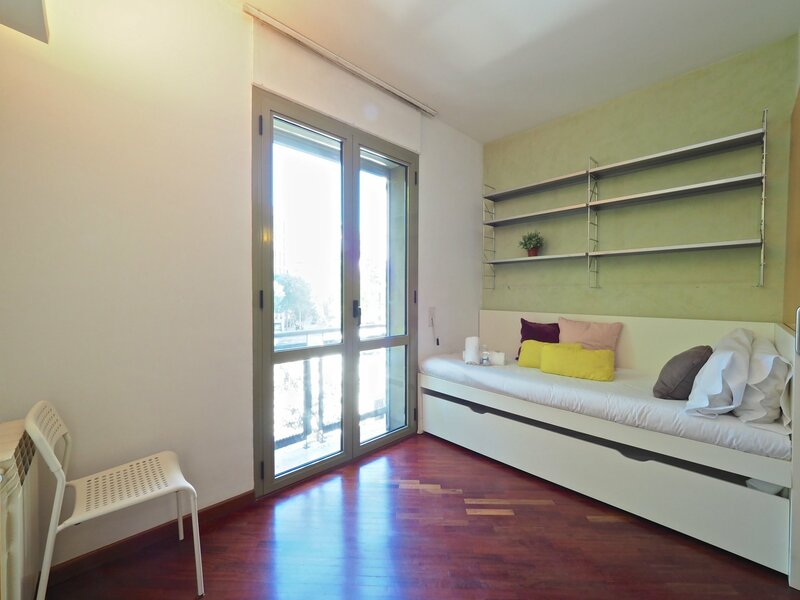 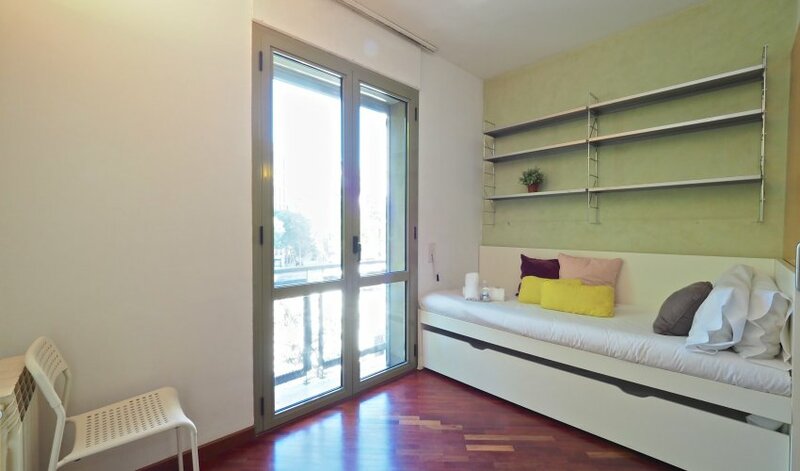 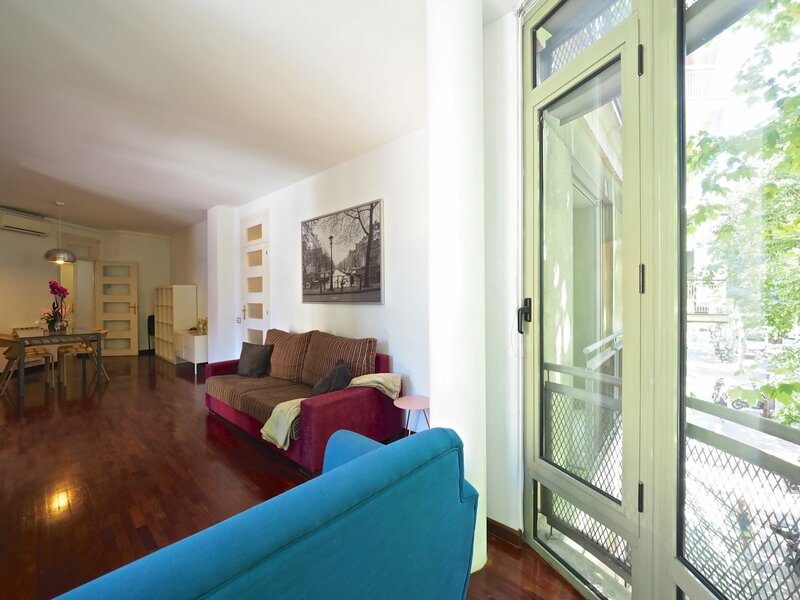 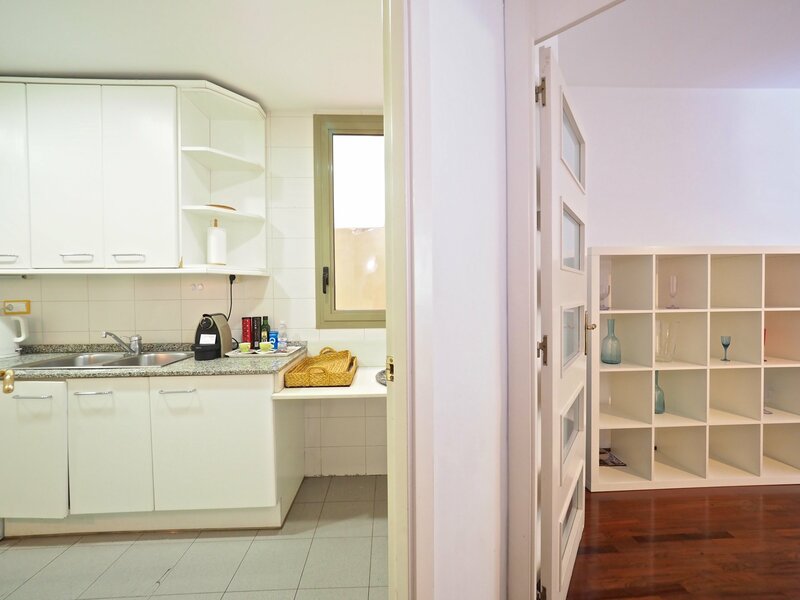 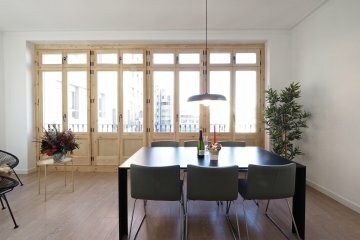 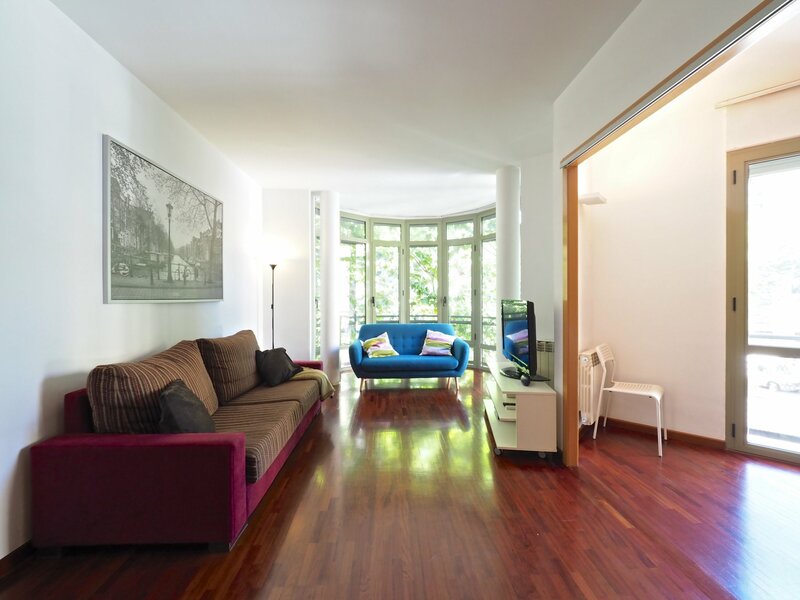 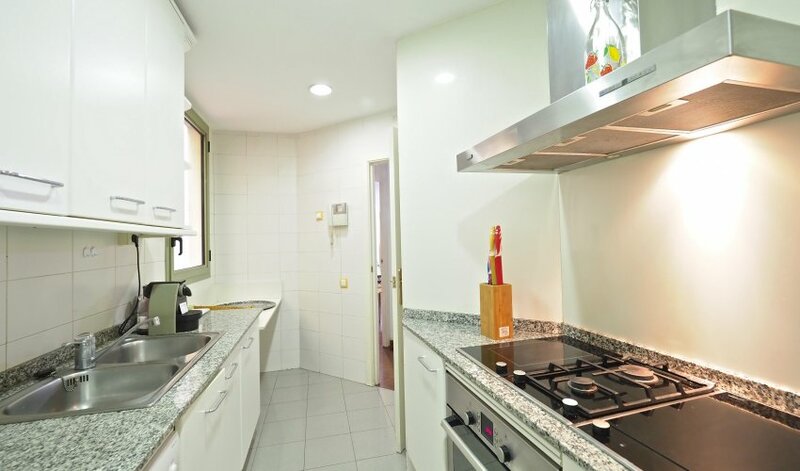 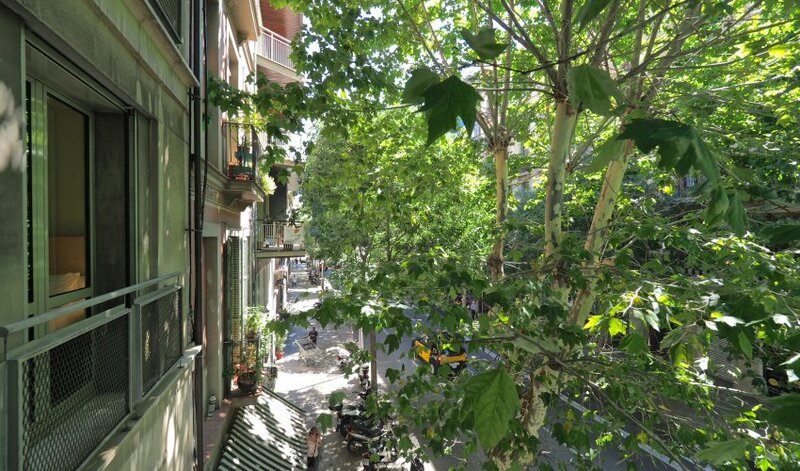 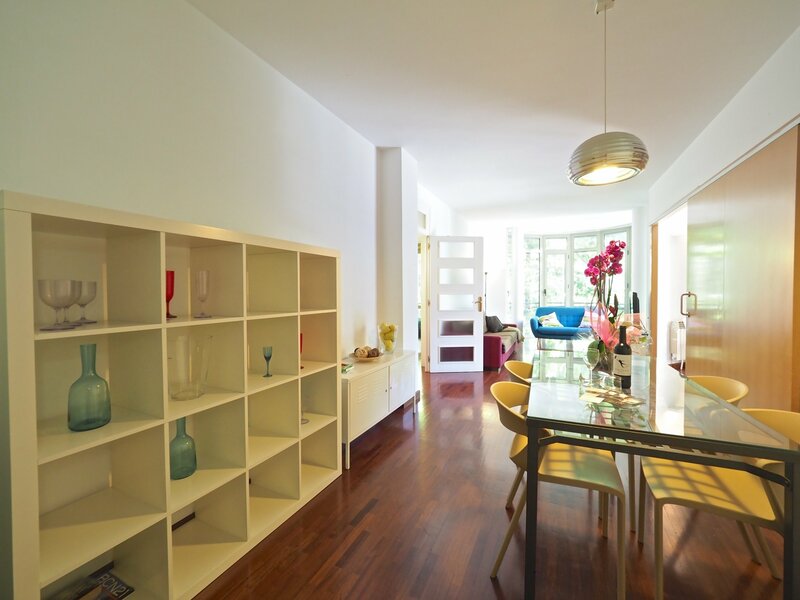 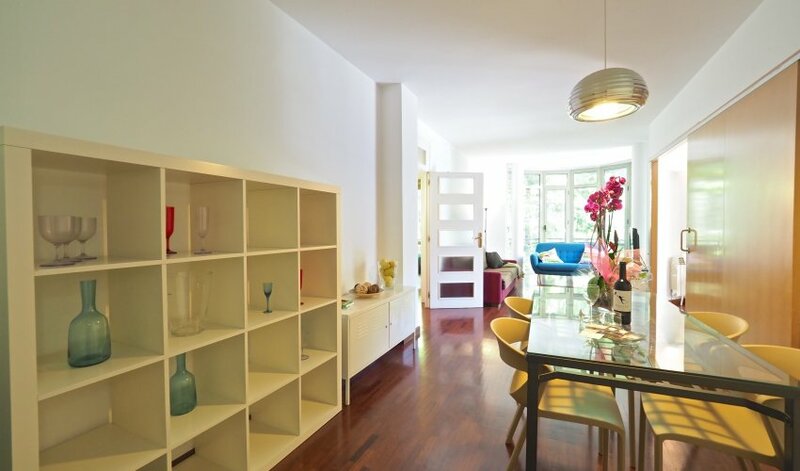 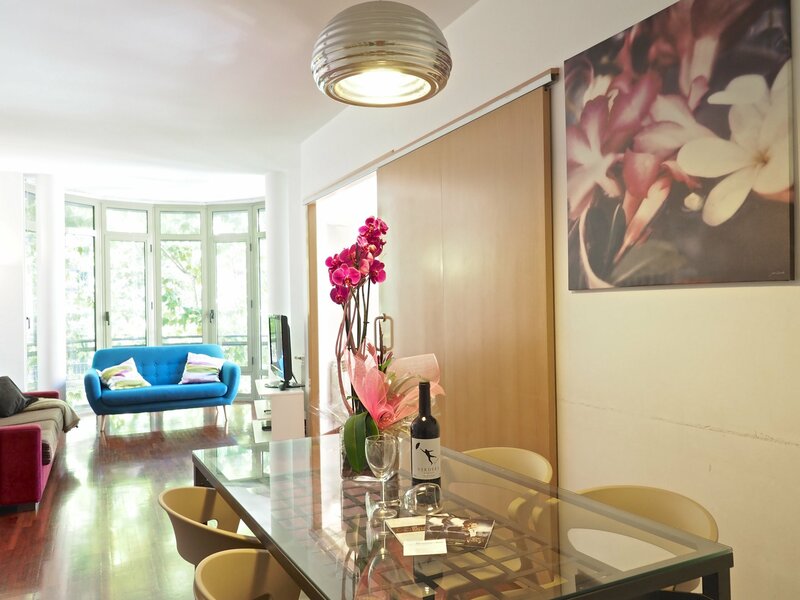 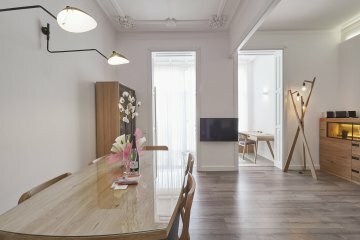 This is one of our apartments in Barcelona located on the right side of the Eixample district. 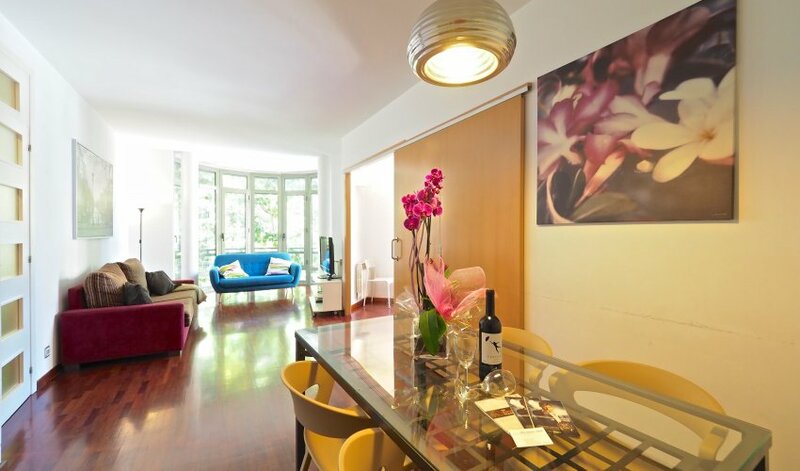 A few minutes walk from the Diagonal, Paseo de Gracia and the Sagrada Familia. 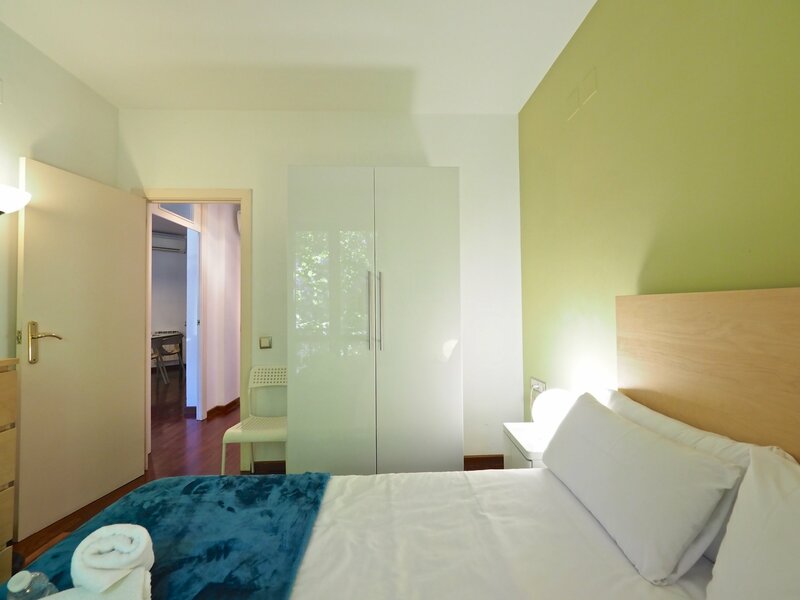 The nearest subway stops are the de Girona (line 4) and Verdaguer (line 4 and 5) a few minutes walk from central Barcelona apartment. 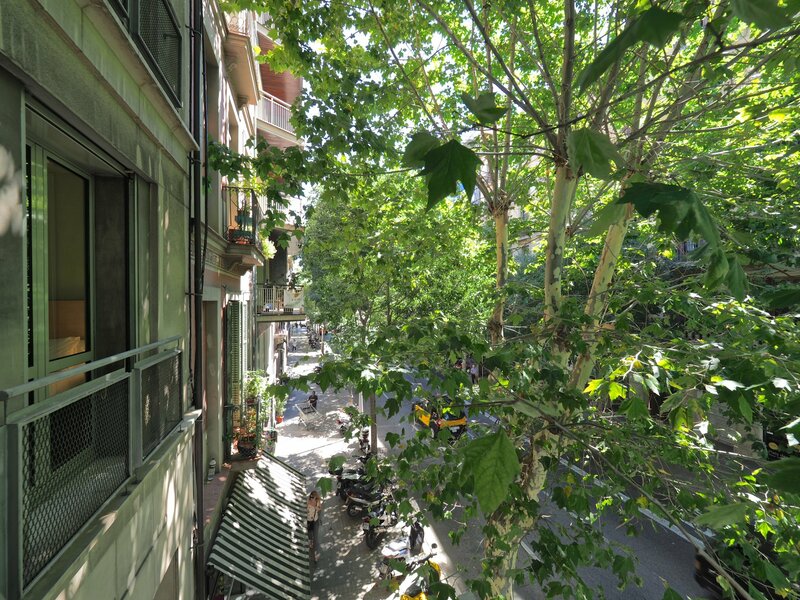 There are also many bus lines to travel to any corner of the city.